Here I am mugging for the camera with my good friend Slippery. Next to Slippery is some guy named Ismael. 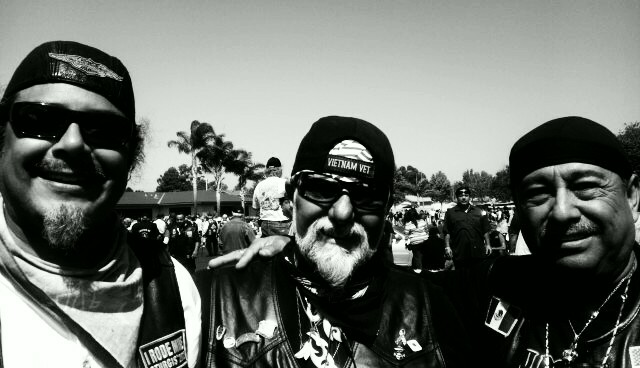 Here we are at the rendezvous point at Pepperdine University. From here we continued north up PCH to Neptune's Net. I had the rainbow trout burger and a beer. 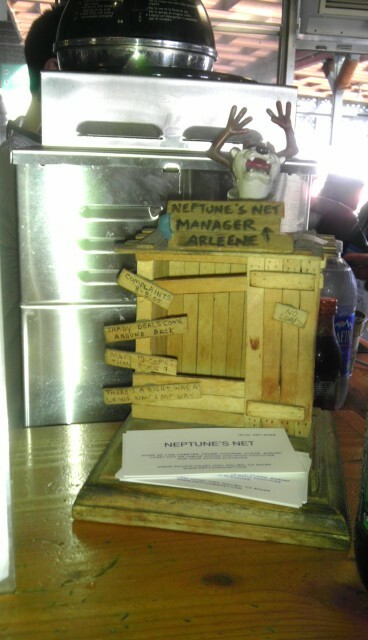 I took a picture of a popsicle sticks hut Neptune's uses to display business cards. The previous day I ordered a trout at the Elephant Bar & Grill. Comparing both meals, Elephant Bar was by far tastier, with the lobster sause, and everything else. The rainbow burger just came with fries, but the Stone Brewing Co. beer I had with it placed it made it a fair competition. Still undecided which was better. A rainbow trout burger .... that sounds really good! I wonder if rainbow trout would make for a good fish taco as well? I need to experiment more, break out of my "hamburgers must have ground beef in them" mentality.